For other people with the same name, see Samuel Green. 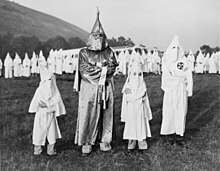 Two children wearing Ku Klux Klan robes and hoods stand on either side of Dr. Samuel Green, Ku Klux Klan Grand Dragon, at an initiation ceremony at Stone Mountain. July 24, 1948. Samuel Green (13 November 1889 – 18 August 1949) was a Grand Wizard of the Knights of the Ku Klux Klan in the late 1940s, organizing its third and final reformation in 1946. Green was born on 13 November 1889 in Atlanta, Georgia. He became an obstetrician and joined the Ku Klux Klan in 1922. By the early 1930s, Green had become the Grand Dragon of Georgia. Starting from the late 1920s, the Knights of the Ku Klux Klan had a problem with declining membership. In 1939, Imperial Wizard Hiram Wesley Evans sold the organisation to two Klan members, Green and James A. Colescott. Colescott served as the Imperial Wizard and Green as his assistant. While Colescott was forced to dissolve the organization in 1944, Green began to reform the Association of Georgia Klans with its focus on white supremacy and anti-communism. In October 1945, his group announced their return to public life with a cross-burning. From the autumn of 1945 to the spring of 1946, the Klan regularly signaled their presence through lighting up "huge fiery crosses" on top of Stone Mountain. During this period, Green and his associates started contacting former Klansmen and inviting them to rejoin the ranks. On May 9, 1946, this version of the Klan staged its first major initiation ceremony. In October of the same year, Green orchestrated a formal revival ceremony on Stone Mountain. According to historian Robert P. Ingalls, the fiery cross lit for the ceremony was between 200 and 300 feet in height (60,96-91.44 metres). The initiation ceremony of the night closely followed the patters established by William Joseph Simmons in 1915. The only problem for the ceremony was that there were more members and initiates present than robes and hoods available to them. Many of them wore handkerchief masks instead of more traditional Klan uniforms. Green sold to Life magazine the rights of taking and publishing photos of the event. The white man was born supreme. ...We didn't want to be reconstructed, and we don't want to be organized! In this period of the Klan, it was relatively normal for Klansmen to attend church service in full uniform. The practice both asserted their predominance in their respective areas, and implied their connection to local church leaders. At times these Klansmen offered cash donations to the congregations. At least some religious figures opposed the practice. For example, Hugh A. Brimm of the Southern Baptist Convention instructed its pastors to refuse to accept "blood money" from the Klan. In his view the Klansmen were covered with the blood of "lynched victims" and their "superficial piety" was merely hypocritical. In 1947, the Klan was included in the Attorney General's List of Subversive Organizations, and denounced as Un-American. It shared the list with organizations embracing totalitarianism, fascism, and communism. In the Klan's case, the list accurately reflected their subversive ideology. While declaring itself the "American social conscience", the Klan consistently favored ignoring and disobeying laws which went against their ideology. Their rhetoric had taken an increasingly anti-statist turn. With the Klan attracting some negative attention, it soon started facing internal problems. Their ranks were infiltrated by government informants, federal agents, and investigative journalists. All were eager to expose the violent nature of the Klan, the one Klansmen publicly denied. The most notable infiltrator was Stetson Kennedy, whose later book I Rode With The Ku Klux Klan (1954) covered the activities of the Klavalier Klub. The Klub was an elite squad of Klansmen devoted to flogging campaigns, active within Georgia itself. By 1949, following the revelations to the public, the Klan's name had become synonymous with terrorism and violence. But this reputation failed to discourage people from seeking membership. In the summer of 1949, shortly before his death, Green himself presided in a major initiation ceremony. About 700 members joined in a single day. Meanwhile, Green led the Klan in renewing its political activities. He was active in the Georgia gubernatorial special election, 1948, reportedly serving as an aide-de-camp to candidate Herman Talmadge. Talmadge was seen as the Klan's candidate for the office. When he did win the election, the Klan took credit for it. According to Stetson Kennedy, Talmadge had promised the Klan "a free hand in any racial rioting". He was elected Imperial Wizard two weeks before his death from a heart attack in Atlanta, Georgia on 18 August 1949. He died in the rose garden of his home. His death weakened the Klan by further splintering its leadership. He was replaced by Samuel Roper. After the Dodgers announced in January that their exhibition games would be in Macon and Atlanta, Green stated "there is no law against the game. But we have an unwritten law in the South – the Jim Crow law. " His statements were against the black players on a white team. During the exhibition games, Green using the influence of Herman Talmadge tried to ban Brooklyn Dodgers players, Jackie Robinson and Roy Campanella. During his command, the Ku Klux Klan infiltrated and controlled the Georgia Bureau of Investigation. Green's successor Samuel Roper was the second director of the Georgia Bureau of Investigation. Green also made alliances with the Atlanta Police Department and Atlanta taxi drivers. ^ a b Newton, Michael (2010). The Ku Klux Klan in Mississippi : a history ([Online-Ausg.] ed.). Jefferson, N.C.: McFarland & Co. p. 252. ISBN 978-0-7864-4653-7. ^ Lay, Shawn. "Post–World War II Klan". Ku Klux Klan in the Twentieth Century. The New Georgia Encyclopedia. Retrieved 4 June 2011. ^ a b Wade, Wyn Craog (1998). The Fiery Cross: the Ku Klux Klan in America (New ed.). New York: Oxford University Press. p. 526. ISBN 978-0-19-512357-9. ^ S., Tanya (29 August 2007). "Money Motivates". Retrieved 11 June 2011. ^ Tuck, Stephen G.N. (2003). Beyond Atlanta : the struggle for racial equality in Georgia, 1940-1980. Athens, Ga.: University of Georgia Press. p. 376. ISBN 978-0-8203-2528-6. ^ Newton, Michael (2009). The encyclopedia of unsolved crimes (2nd ed.). New York: Facts on File. p. 364. ISBN 1-4381-1914-3. This page was last edited on 13 March 2019, at 06:42 (UTC).